The Allen Memorial Art Museum (abbreviated "AMAM") is located in Oberlin, Ohio, and is run by Oberlin College. Founded in 1917, its collection is one of the finest of any college or university museum in the United States, consistently ranking among those of Harvard and Yale. The collection contains over 15,000 works of art. The AMAM is primarily a teaching museum, and it is a vital cultural resource for the students, faculty, and staff of Oberlin College as well as the surrounding community. Notable strengths include seventeenth-century Dutch and Flemish art, nineteenth and early twentieth-century European and contemporary American art, and Asian, European, and American works on paper. 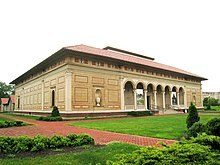 The collection is housed in an impressive Italian Renaissance-style building designed by Cass Gilbert and named after its founder, Dr. Dudley Peter Allen (B.A., 1875), a distinguished graduate and trustee of Oberlin College and the first husband of Elisabeth Severance Prentiss, whose bequest as Mrs. F. F. Prentiss included parts of her art collection started during her first marriage. The AMAM is also known for its art rental program which enables Oberlin College students to rent works of art by notable artists such as Renoir, Picasso, and Dalí for five dollars a semester. In 1977, Robert Venturi and Denise Scott Brown designed an addition that represents one of the earliest and finest examples of postmodern architecture in the United States. In 2011, the historic museum underwent a two-year retrofit; after which it was awarded with USGBC LEED Gold certification. Allen's Central Rotunda, which contains the Egyptian, Greek and Roman art wings. The Allen Memorial Art Museum has an outstanding collection of more than 12,000 objects – including paintings, sculpture, decorative arts, prints, drawings and photographs – that provide a comprehensive overview of the history of art from a variety of cultures. The collection is particularly strong in European and American paintings and sculpture from the 15th century to today, and has important holdings of Asian paintings, scrolls, sculpture and decorative art, including a large group of Ukiyo-e prints. High-quality ancient Egyptian, Greek, Roman, African and Pre-Colombian art is represented. The museum also houses the Eva Hesse archives, which includes the artist’s notebooks, diaries, photographs and letters, and is proud to oversee, along with the Art Department, Frank Lloyd Wright’s Weltzheimer/Johnson House. At the beginning of every semester students camp out in front of the north gate of the museum to get first pick of original etchings, lithographs and paintings by artists including Pierre-Auguste Renoir, Andy Warhol, Salvador Dalí, and Pablo Picasso. For five dollars per semester, students can hang these works on their dorm room walls. The program was started in the 1940s by Ellen H. Johnson, a professor of art at Oberlin, in order to "develop the aesthetic sensibilities of students and encourage ordered thinking and discrimination in other areas of their lives." Wikimedia Commons has media related to Allen Memorial Art Museum.